Share this product and receive a $4.20 sharing discount. With its simple, clean lines and black patina, this religious gift reminds us to have faith. These three words are especially powerful to those facing uncertainty, illness, or the unknown. Praying and reading these words daily creates peace within. This cross reminds us that we are all where we are meant to be in the moment and to trust in God’s love. Christian scripture encourages us to live without fear. 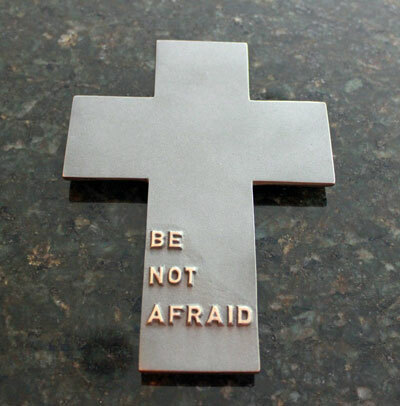 “Be not afraid,” Jesus reminds us. This wall cross is a meaningful religious gift for any graduate, for anyone who is beginning a new path in life or for anyone facing uncertainty. This Christian symbol of faith reminds us that Jesus is with us and always at work within us. Such a cross is a thoughtful gift to those who need encouragement, comfort and support. 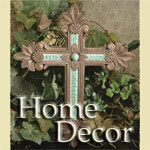 This sleek wall cross measures 6 x 4.25 inches and can hang indoors or outdoors. It is made of solid bronze and has a beautiful black patina. The lettering is raised and highly polished to contrast against the black patina. Solid Bronze Cross with Black Patina. Measures 5.5" x 4". Made in Germany.